This research does not mean that we shouldn't use various methods and media to deliver content to our students. It just means that we shouldn't try to limit ourselves due to the labeling process that the learning styles movement has been pushing for the past decade or so. Good teachers use audio, video, group activities, critical thinking, and many other methods throughout their teaching. It is the combination of these that makes a teacher effective. It isn't about reaching the "auditory" or "kinesthetic" or "visual" learner. Rather, we should strive to reach ALL students through auditory, visual, and kinesthetic means. In the end, we all learn from the information we gather through each of the senses, not just one sense, as the learning styles theory would have us believe. 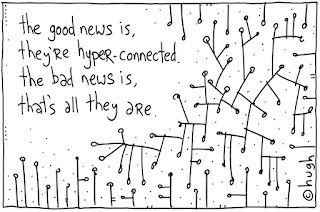 This is why social networking is such a powerful tool. I'm humbled to think of the power it holds. I just might share this story with my students in the morning to demonstrate how far Facebook can take them. The truth is that, aside from occasionally organizing group work, they use it for silly banter and even online bullying. It isn't that these activities aren't important for developing 21st Century social skills, it's just that social networking can do so much more! December 7th commemorates an important day for Americans; Pearl Harbor Day. In Iran, the date has a different significance. It is 16 Azar, AKA National Student Day. An Academia.org article explains that on this day students on university campuses around Iran stage demonstrations to show solidarity for the three students who were killed while protesting the Shah in 1953. Traditionally, these protests have included some anti-American sentiment, but this year was different. First, there was the deeply questioned reelection of President Mahmoud Ahmadinejad in June that led students to question whether their votes were truly counted. Then, in the protests that followed the announcement of the controversial election results, millions worldwide witnessed the violent death of young protester Neda Agha Soltan. It was posted on YouTube and distributed virally for days. This year, instead of targeting America, Iranian university students directed their 16 Azar protests at their own government. The Iranian government issued notice to the media just before December 7 that their licenses were suspended for three days to prevent reporting on the protests. The government also orchestrated a "wave of arrests," as it is put in a Tehran Bureau article, of student leaders in the days leading up to 16 Azar, but their efforts were unsuccessful. Largely due to social media, such as Twitter and Facebook, university students are more organized than ever. Videos of student protests that started on December 7 are all over YouTube. These are the kind of global events that we need to show our students so they can understand the true power of social networking. 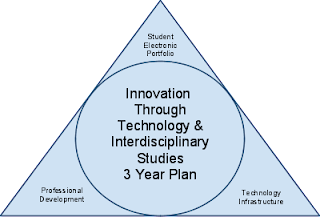 After three colleagues and I presented a mock grant application in our graduate class this evening, which focused on "Innovation Through Technology and Interdisciplinary Studies," I really spent some time thinking about the value of interdisciplinary work, especially at the high school level. Accordingly, I decided to do some further reading on the topic. Collaborative teaching exercises enrich the curriculum and allow teachers to share in a meaningful experience, bringing together diverse expertise and enhancing collegial respect. Rather, improvising puts you on the hot seat; it lifts the energy level and immediacy of your class discussions; and, with the use of immediately accessible Internet resources, it demonstrates to the students in an authentic and representational way the power of history, the natural interdisciplinary quality of comparative analysis, and the value of being able to access and distinguish valid and documented support for one's position in a discussion. As usual, Will Richardson is a forward thinker. In a blog post from way back in 2006, he contends that he wants his legacy and value in the world to be based on the work that he has done in collaboration with others, not based on his expertise in a certain area as proven by the letters he has accumulated after his name. My point here is to talk about how this relates to the whole teacher as learner discussion in that we are now living in a world where collective intelligence is becoming more powerful and relevant to being a learner, but we’re educating our kids in classrooms still under this idea of experts at the front of the room. ...You can believe me or not…your choice. But you can believe me based on my track record and my participation as a learner in the community, not simply based on the letters after my name or the diplomas on my wall. These are the opinions of only three well-respected educators, but I agree. Interdisciplinary education is important because we are preparing our students for a world with complex issues that require a multi-perspective approach. Without showing them how the different areas of study relate to one another, we are not meeting the needs of our 21st Century learners. "Learning Styles" & "Differentiation": Buzzwords Debunked! I like this video. It confirms a theory I have had for a while. Most of the job interviews in education that I have been a part of, either as an interviewer or interviewee, have involved at least one question about learning styles and differentiated instruction. I have always been a bit critical. In one of my former districts there was relentless training on learning these topics. They paid top dollar for experts and consultants to run workshops. Quite often, I seemed to find that I was already doing some version of the teaching strategies they preached. Sure, I may have added some enhancers from the workshops, but nothing I would really consider ground-breaking. I've taught both heterogeneous and homogeneous classes. I've had classes with special education aids and one-on-ones, while a self-reliant future valedictorian sat two rows over. In the end, isn't it just about delivering a message effectively to all students? Shouldn't teacher find several ways to explain information to her students so that they can understand it from different perspectives anyway? Daniel Willingham is an expert. He argues that there is no such thing as learning styles. Willingham does a nice job of debunking these education buzzwords and getting to what should be the meat of educational practice. He is also the author of Why Don't Students Like School?. Bill Evers, who has an impressive background in education, wrote a great review of the book. As you read the book (you can get a preview on Amazon.com), you may find yourself nodding your head in agreement. It is as if he is stating the obvious, but it is stuff that we have been misinterpreting because we are so programmed to think that learning styles and differentiation are the key. It isn't about learning styles. Instead, it is about conveying the information in a way that will make our students feel successful. ALL students will have to work hard and think hard in order to improve and develop their minds, but sometimes they need a task that teaches content and is fun enough to keep them motivated along the way. Usually, that means mixing traditional teaching strategies with innovative ones. Like, have students draw symbols of the ideas you discuss, instead of taking notes the traditional way. Or introduce a new topic by showing a series of images and ask the students to make connections between those images, instead of simply standing at the front of the room and telling them about the new topic. This is why each student doesn't need a differentiated lesson specifically tailored to him. All students need good teaching. Good teaching utilizes several ways to present and explain ideas to all students, rather than finding the one way each student needs the idea explained to him. That was a silly student-created video on cheating, but the rest of this blog is serious. One of the assistant principals at the high school sent around this article from the San Francisco Chronicle. It's a long article, but worth reading if you are interested. There were a few statements that really stood out to me, though. Pope says use of stimulants is on the rise in high school, and more and more kids are using them to take the SAT. As in the debate over the use of steroids in sports, some students don't feel it's morally wrong - because it's still your brain at work - and are ignoring the health risks of taking a drug not meant for them, with no monitoring of dosage or side effects by a doctor. Pope says when she wrote "Doing School" (published in 2001), "it was No-Doz and caffeine. Now, especially in the past five years, it has switched to Adderall, Ritalin and illegal stimulants." I knew plenty of classmates in college who used Adderall, Ritalin, etc. that wasn't prescribed to them for studying purposes. The would pull all-nighters, take the exam, and then crash. Often the results were actually pretty good. When the payoff a student is seeking is actually achieved, what is to stop her from taking the drugs again for the same purpose? I'm saddened that this practice has spread to high schools; saddened, but not surprised. "We call it the morning scramble," says Pope. "In the morning at a high school, you see a ton of kids sitting around copying each other's homework. Because a percentage of their grade is based on their turning in their homework. And a lot of these kids are doing so many classes and after-school activities that there's no way they could possibly do all the work required of them. So kids don't even count that as cheating. That's just sort of survival for them: divvying up the work. That's why they're IM-ing (instant messaging) all the time while they're doing homework. It's another way of divvying up the work. It's a way of ensuring that you get it done. It doesn't matter how you do it, just get it done and get it in." This actually happened to me earlier in the school year. I gave a quiz for which students could bring their notes. I let them type the notes with the caveat that I would check them to ensure they hadn't shared with one another or copied and pasted from the text. I discovered, after everyone had taken the quiz, a group of 5 students who had split up the work. When I confronted them, they were shocked that I considered it cheating. Even several of the parents blatantly told me that they did not consider their children's actions something that would qualify as cheating. After more discussion and research, I found out that many many more students had done the same thing. Rather than ask the kids to tell on each other (and create a culture of distrust among the students), I decided to throw out the entire quiz. Yup, I was willing to be the bad guy in order to send a clear message. My decision was only made after much consultation with other teachers. More controversy erupted from that decision. Once again, I heard from many parents who didn't see the cheating as a good enough reason to justify throwing out the quiz, even though they admitted that, overall, it was not a valid assessment of the students' knowledge or skills under the circumstances. Each parent's argument was based on the concept that his/her child would lose points toward the overall grade. It is all about grades. Integrity seems to take a back seat to the grades. It used to be that cheating was done by the few, and most often they were the weaker students who couldn't get good grades on their own. There was fear of reprisal and shame if apprehended. Today, there is no stigma left. It is accepted as a normal part of school life, and is more likely to be done by the good students, who are fully capable of getting high marks without cheating. "It's not the dumb kids who cheat," one Bay Area prep school student told me. "It's the kids with a 4.6 grade-point average who are under so much pressure to keep their grades up and get into the best colleges. They're the ones who are smart enough to figure out how to cheat without getting caught." The anecdote from my own teaching is based on an honors level class. I know that they are the ones under the most pressure and likely to do whatever it takes to succeed, even if it means cheating. On the other hand, there is a little part of me that is proud of them for working together and taking care of one another. Some students feel like they are living their lives in a pressure cooker. If a friend can help release some of the steam and relieve a little pressure, isn't that person a good friend? Technology has made cheating easier and more sophisticated. But Pirouz says it's not causing the rise in cheating. "Cheaters are causing the rise. Technology is a catalyst, but text-message cheating is big because the cheaters are sending out the message. Some people keep their integrity, but some fall into the trap when it's suggested." The Internet has provided all sorts of shortcuts for cheaters. They have Wikipedia at their fingertips, and thousands of ready-made term papers available for downloading from sites like Cheaters. com, Schoolsucks.com and Schoolpapers.com. The role technology plays in cheating is HUGE! The conflict I feel is that I love technology and what it makes possible for me to do in my classroom and for my students to learn. Networking tools make it possible for my students to do group projects without ever meeting face to face. They also make it possible for them to text answers to each other during tests. How do we strike a balance? How do we help students to understand why cheating is wrong when society rewards them based on results, not methodology? How can we punish kids who are just trying to help each other out when they recognize a friend at the brink of a breakdown?